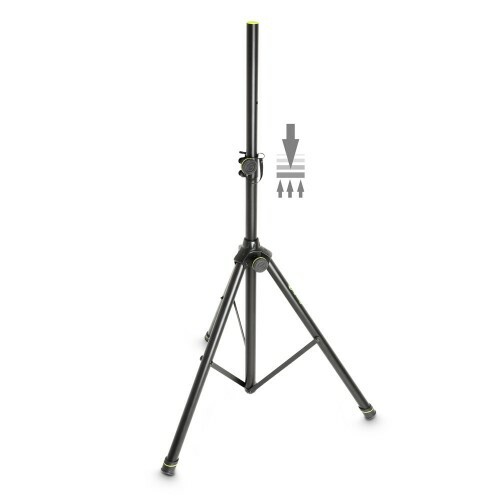 The GSP 5211 ACB is a classic tripod speaker stand made from thick walled, yet lightweight powder coated aluminium tubing with a maximum height of 195 cm. Featuring a built-in air brake it allows you to lower loads up to 50 kg with minimum effort. The die-cast aluminium leg collar has been completely redesigned to provide superior durability and longevity. To provide superior strength the height adjustment collar is made of steel and is virtually indestructable. A safety pin securely locks the 35 mm diameter extension pole in place. The ergonomic set screw knobs are made from high grade ABS with a soft touch, non-slip thermoplastic coating for comfortable operation. A set of black coding rings is included with the SP 5211 ACB, additional ring packs are available in a wide array of colors for instant personalization.